Since I stopped working downtown four years ago, I'm not normally in the 78701 ZIP code, but that's where a TON of amazing happy hours in Austin happen to be! So, when I was invited to a Taco Tuesday happy hour at Upstairs at Caroline, I sucked up my distaste for parallel parking and headed to Seventh Street and Congress Avenue to check out the happening Tuesday event. While the upstairs (duh) area was bustling, the weekly Taco Tuesday event was a delight! From 4-7 pm, the eatery offers $2 tacos and $7 frozen prickly pear margaritas. I, of course, ordered the marg (after asking the waitress about how sweet it was--I'm ashamed to admit that I don't LOVE margaritas as much as my Austinite blood should allow), and it was a perfect balance of sweet and boozy (and super cute too boot!). For my second cocktail, I went off the happy hour menu and ordered the Bad Life Choices (a frosé with Grey Goose and watermelon and an everclear floater). Since I'm not a hard-partying 20-something (anymore), I declined the everclear topper, making mine a Not-So-Bad Life Choice. It was very delicious (so much so, that I forgot to photograph it, whoops!). I ALSO totally forgot to photograph my taco, but to my defense, as delicious as tacos are, they are never very attractive (it's true, admit it!). The Braised Brisket taco with chipotle ranch, avocado, and pickled onion was the perfect accompaniment to my boozy beverages. And, it was only $2! Where can you even find a $2 taco in Austin, nowadays?! 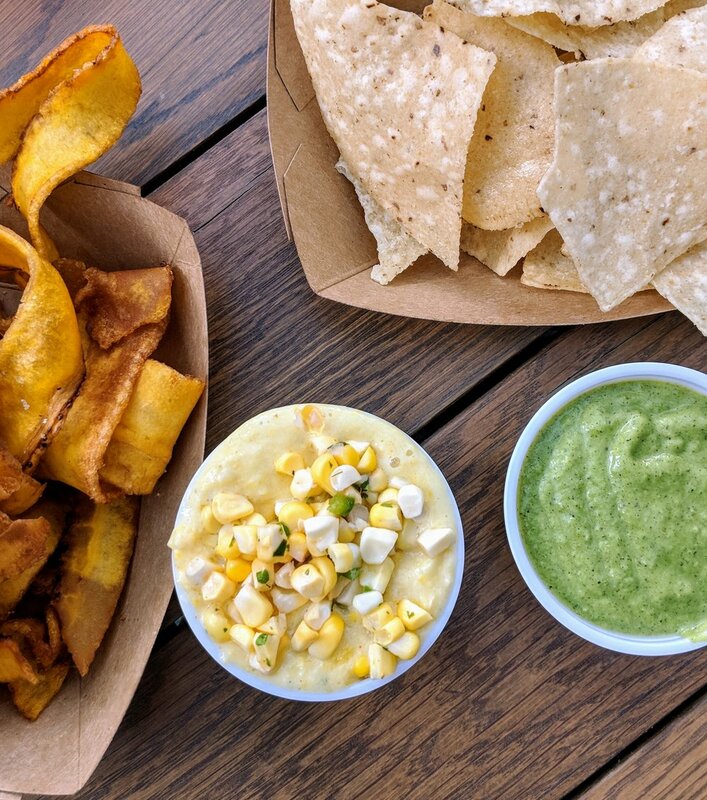 Although not included on the happy hour menu, Upstairs at Caroline's chips and dips menu is not to be missed! The Mexican street corn dip was addictive AF, and I would have eaten it with a spoon. Plus: There are six other tasty options and four chip options (don't skip the plantains!). * Disclaimer: Meal was provided.